Just because they share the same section at the pet store doesn't mean pocket pets are meant to live together: Some seemingly similar pets can't even be friends. One small and furry rodent may share cuddly attributes with other common pets, when in reality the species just aren't compatible, even among rodent species. While all pets have distinct personalities, you must take natural factors into account before thinking a rat and guinea pig can be buddies. Letting a pet have closely supervised meet-and-greets is a whole lot different from letting a rat and a guinea pig share the same habitat. Ask yourself whether your goal is a rat and guinea pig that enjoy sniffing each other through cage bars or consolidating cage space and making these two species roommates. Depending on your pets' personalities, a safe introduction through cage bars can satisfy one pet's curiosity about the other in the room. But housing rats and guinea pigs together is not recommended. Rats and guinea pigs are both social animals who should live with others of their own kind. Even so, they're territorial in spite of being social. Rats who weren't raised from birth together shouldn't share a habitat for risk of fighting, and guinea pigs can fight for dominance if more than one male exists in the habitat. A natural instinct to guard one's territory, or to view a different creature as a predator, could set off fighting between rats and guinea pigs. Both species need room to exercise to suit their energy levels, and that might not be suitable if you pair this odd couple. A rambunctious rat with a need to swiftly climb and explore could prove irksome and even risky for the larger but less dexterous guinea pig. Guinea pigs are herbivore prey animals. An ill guinea pig will innately try to hide any signs of sickness as long as possible for this very reason -- in the wild, that would make him an easy target for wild cats, coyotes and wolves. Rats, meanwhile, are omnivore predators -- they eat plants and animals. They're also prey of many of the wild animals that would feast on a guinea pig. Your rat won't eat your guinea pig, but he might bite. A risk exists that serious injury could occur by keeping such different animals together or by even letting them play together under your supervision. The Merck Veterinary Manual characterizes guinea pigs as "nervous" animals sensitive to subtle environmental changes. Many veterinary authorities warn that you shouldn't keep different rodent species together because of the risk of interspecies disease transmission. While you should keep guinea pigs and rats in separate cages, you can keep the cages in the same room. Even without taking into account temperament or health concerns, guinea pigs aren't climbers; they require a large, low area in which to run. Rats need a taller cage with ramps and stuff to climb. 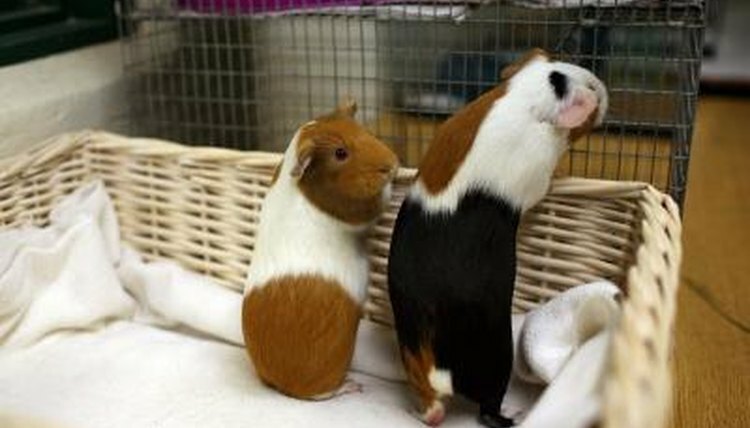 Guinea pigs have specific dietary needs; rats are famously scavengers. Nevertheless, rats need a good-quality pellet and some fresh fruits and veggies, and can have bits of people food such as egg and chicken as treats. Guinea pigs need a vitamin C supplement, pellets, lots of hay, and fresh fruits and veggies. Every owner of a small pet has a story about an unlikely pairing that has occurred after two distinctly different pets meet: The rabbit and the cockatiel who are fascinated with each other, the chinchilla who enjoys chasing the cat. But responsible owners take into account size, health risks, energy level and temperament before letting two species of pets have playtime in the same room -- If you're willing to let the two species play together, supervise every minute. Let an abundance of caution guide your years of happy rat and guinea pig ownership.